Tero Saarinen, a former member of the Finnish National Ballet, began his physical training as a hockey player and gymnast. His father took him to his first dance class and he fell in love with the art form. Saarinen explained during a pre-show chat that Morphed is a commentary on masculinity that explores how men can be sensitive, fragile, and sensual while also being strong. Surrounded on all sides by long hanging ropes, the seven male dancers in Morphed were diverse and unique movers who expressed their individuality on stage. They begin by walking in a square and diagonal pattern, crisscrossing each other’s paths. Gradually, the square grew larger and their pace increased. Saarinen explained that the ropes represent masculinity for him and it was true that their abundance gave the stage an industrial feel while at the same time creating the suspense of wondering when the dancers were going to interact with the ropes. Through contrasting sequences of soft and harsh movements, the dancers expressed a full spectrum of male identity. At times robotic and repetitive and at others expansive and lyrical, these dancers also demonstrated their versatility. Finally, one dancer began to play with the ropes, gathering them into a bundle and twisting them. 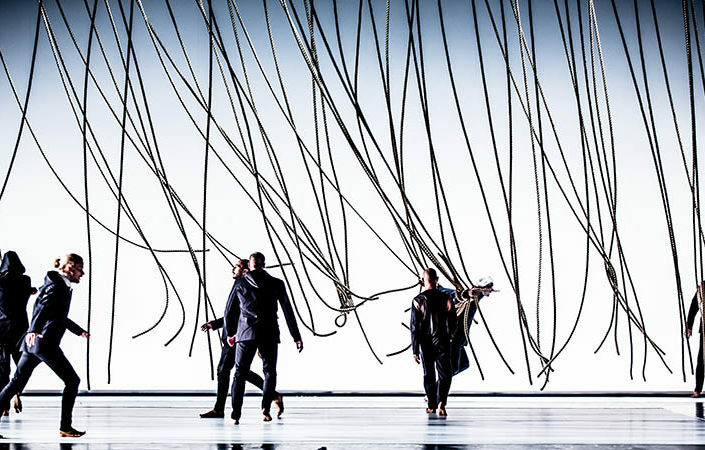 One of the most compelling ways the ropes were incorporated was having them mirror the music, their ripples matching a particular crescendo or phrase in the composition by fellow Finn and Principal Conductor of London’s Philharmonia Orchestra, Esa-Pekka Salonen. Nearing the end of the piece, the dancers seemed to be evoking a desperation to find their identity while struggling to come to terms with who they were. As the choreography became more chaotic and the cohesion seemed to disintegrate, the dancers became lost in themselves, dancing alone together and continuing to do so as the curtain came down.